This is the main view of a painted mural covering the walls and passage way of a walk through lobby. Other walls were painted in faux stone as a mural of an archaic ruin partially overgrown with plants and vegetation, this linked to the existing decorative use of the space as an indoor arbor. 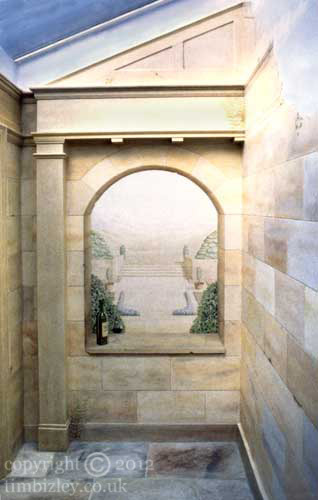 The choice of stone was influenced by the existing flooring,often the muralist is required to accommodate extant elements of a design scheme into the mural itself. This usually serves to enhance the harmonious feel of the space, and the sense of congruity with which the mural itself fits into its setting. Murals are almost by definition site specific art works.